SHUT UP I LOVE THAT: getting my Ferris Bueller on? getting my Ferris Bueller on? I popped into the Penfield sample sale a couple weeks ago in hopes of finding an amazing winter jacket. Alas I didn't find just right one, but instead picked up this blue cable knit wool sweater. It's a little big and insanely warm, aka perfect for winter. Then today, I was browsing Nerd Boyfriend, and saw this picture of Matthew Broderick. I mean, no, they aren't exactly the same, but similar enough, right? 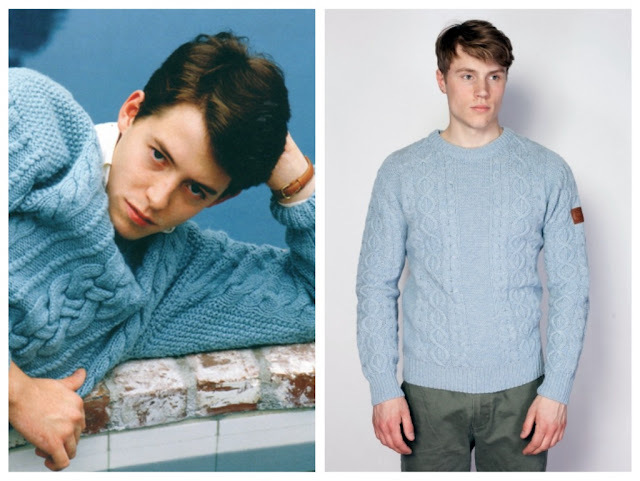 I suppose if I'm not getting my Sloane Petterson on, then Ferris will have to do.